Content marketing studies tend to be happy-go-lucky affairs. Companies are investing more money, executives are buying in, teams are more sophisticated, and so on. Every year since 2010, the Content Marketing Institute has put out one of those studies on the state of content marketing. CMI’s analysis of B2B content marketing is a prime example of how to get earned media. Positive statistics demand coverage and dominate headlines. But I wanted to dig deeper to draw out more unorthodox insights from the report—and not all of them are good. Here are 4 takeaways that examine the state of B2B content marketing and point out some areas where marketers need to improve. Traditionally, content teams have been siloed from the rest of the marketing department. The idea of a centralized content operation, however, is something analysts like SiriusDecisions have been advocating for years. And according to CMI’s study, that centralization is currently taking place across the B2B space. This graph struck me as an interesting starting point for further research. I’d be curious to know what kind of content these teams create: Are they mostly producing content for a blog? Or are they also heavily involved in sales enablement, event content, customer success content, and so on? Perhaps that’s something for next year’s study. We talk a lot about the importance of mapping content to the buyer’s journey, and we’re not alone. Particularly in B2B marketing, ensuring that you have content for the right audience at the right time is key to achieving content marketing success. Yet, per CMI’s study, only 41 percent of B2B marketers claim to create content based on the buyer’s journey. That’s particularly surprising given that 72 percent of respondents are concerned with how content impacts customer experience. Since customer experience is largely based on a buyer’s journey through the sales funnel, mapping content to each step should be an important part of ensuring a great experience. If your inbox looks anything like mine, it shouldn’t be surprising that email is the most used content distribution tactic in B2B. Ninety-three percent of B2B marketers use email to distribute content. (Social media is right behind at 92 percent.) And 74 percent of respondents named email as the most effective distribution format, 29 percent above the next closest method (blogs). Despite this, only 70 percent of B2B marketers are using email tools to manage their distribution. That gap of 23 percentage points is concerning because B2B marketers shouldn’t be wasting time and resources by manually creating email lists and sending out messages without any insight into their performance. Measuring ROI is one code that plenty of marketers still have trouble cracking. Sixty-five percent of B2B marketers either don’t measure it at all or are “unsure” if they measure the ROI of their content marketing. Incredibly, the most given reason for why is that there isn’t a “formal justification required.” Thirty-eight percent of respondents also admitted that measuring ROI is too difficult. 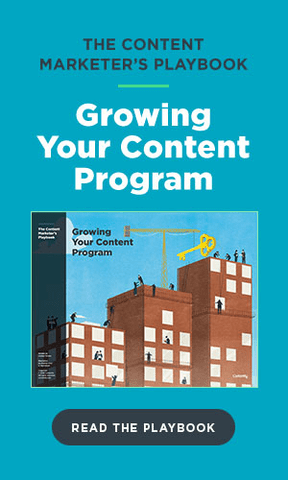 There’s no getting around that measuring the hard impact of your content requires intensive organizational capabilities and lots of hard work. But the marketers who aren’t even trying to figure out how to track ROI won’t stick around much longer. At some point in every competent business, executives will question the marketing budget, and content marketers will have to justify their work. If those 38 percent of B2B marketers aren’t prepared, they risk losing everything they’ve built. And if that happens, don’t be surprised if this normally rosy study suddenly gets much bleaker.